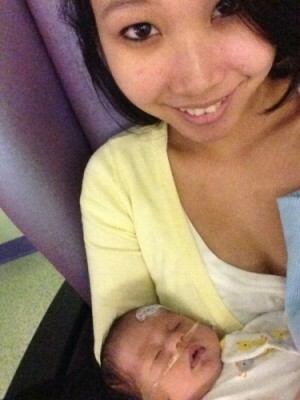 Liam Kaye Vongpradith’s short life ended too soon due to multiple health complications. 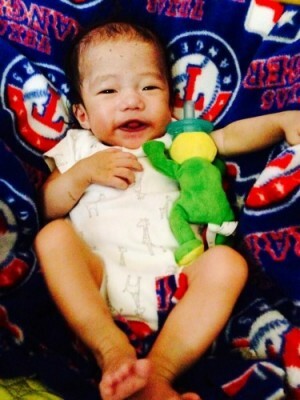 Liam lived from March 25 to Nov. 1, 2013, and spent much of his brief life at Cook Children’s with critical issues ranging from an operation to repair his intestines, to heart problems, to feeding concerns. He seemed to be constantly fighting until it was too much for his little body to overcome. Now a little over a year later, Vickie Phathaphone, Liam’s mother, looks back on her time at Cook Children’s with an emotion that may be surprising to some – gratitude. Recently, Phathaphone reached out to Cook Children’s Facebook page. She wanted to thank the staff who treated her little boy. Phathaphone said doctors and nurses updated her family every day and Cook Children’s updated her by cellphone as needed. She said the NICU nurses taught her so much, ranging from the importance of breast milk and how to pump it, to how to carefully bathe, feed and hold her fragile baby. After letting a group of the physicians know about the letter, they were appreciative of Phathaphone’s kind gesture and began to reflect on the loss of not only Liam, but other children who have died too soon. Surgeons Vincent Tam, M.D., James Miller, M.D., and Lisa Roten, M.D., a cardiologist, share with us what their life is like after the loss of a child. He tries to stay in control as he fights back the tears. But on this day, as hard as he tries, Vincent Tam, M.D., a pediatric heart surgeon at Cook Children’s, struggles to keep his composure. He’s thinking about Liam. Dr. Tam performed two heart operations on Liam. All the procedures were successful, but other underlying problems were simply too much for the baby, who was born premature, to overcome. In practice for 23 years, Dr. Tam copes with the death of a patient by compartmentalizing the loss. He tries his best not to dwell on it, so it won’t impact his performance in the operating room or his role as husband and father. Then, every once in a while, he receives a note or hears from a parent whose child has died, like the one from Phathaphone. The parents don’t want to express grief or even anger, but simply to say thanks. Shortly after Liam’s birth, James P. Miller, M.D., a pediatric surgeon at Cook Children’s, operated on him to repair gastroschisis, a condition where the baby is born with the intestines on the outside of the body. Even after 17,000 surgeries and 27 years as a surgeon, it only takes a quick glance at a child’s chart for the memories to come flooding back. He remembers Liam and his mom. He says he knew from being around her for a short period of time and the love and compassion she always showed to her child, Phathaphone would be a great mom. Dr. Miller has gotten to know some patient families well over the years. Throughout his career, he’s been to many of their weddings, but he’s also seen death. For the patient families who are cared for by Lisa Roten, M.D., a cardiologist who specializes in fetal echocardiography at Cook Children’s, they see someone who cares deeply for her patient families. But they also may be surprised to know that she understands Dr. Tam’s need for compartmentalization. Still, Dr. Roten admits to developing a special bond with most of her families and says a gesture like the one from Phathaphone and other parents means a lot to her. As much as the families sometimes need closure by writing a note or speaking to the doctors, Dr. Roten also needs to find a way to say thank you to the parents for entrusting their child’s care to her and goodbye to the children. Dr. Roten makes every effort to reach out to families who have had a child pass and to go to the funerals whenever possible. It allows her to complete the circle of care. “At the end of the day, we’re all humans. We are people who have families and we are touched by these families we see,” Dr. Roten said. “Even after the child dies, they never really leave our lives. There are ways that we continue on together. We take our cues from the family. If they ever want to reach out or touch base with us, that’s comforting to us. It is the end of a relationship that sometimes you’ve had for years and years with families and sometimes like in Liam’s case, it’s been shorter.